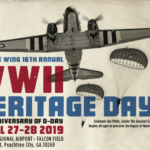 Oxford, Conn. – March 28th, 2019 – The D-Day Squadron, part of the Tunison Foundation, announced today that the organization will be hosting a press conference during SUN ‘n FUN, one of the nation’s premier airshows, aircraft exposition, and fly-in. The press conference will take place on April 2nd, 2019 at 10 a.m. Eastern Standard Time and will provide members of the media and general public a chance to connect with some of the pilots and crews that will be crossing the North Atlantic in 70+ year old aircraft to participate in the 75th anniversary of the invasion of Normandy. Click HERE to register for the press conference and media flight. 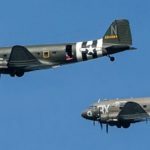 The C-47 and DC-3 aircraft of the D-Day Squadron that will be participating in SUN ‘n FUN in include C-47s Placid Lassie, That’s All, Brother and Tico Belle, as well as the DC-3 Flabob Express. Flabob Express will be making a flight from California to attend this event. There will be plenty of opportunities to see the aircraft in action, as they will be practicing formation flying during the week of April 2nd-7th 2019 and participating in the airshows of SUN n FUN on April 6th-7th, 2019. 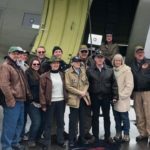 This spring, the D-Day Squadron will fly the original “Blue Spruce” route, with C-47s departing from Oxford, Connecticut (KOXC); stopping to refuel in Goose Bay Airport (CYYR) in Newfoundland, Canada, Narsarsuaq Airport (BGBW) in southern Greenland, Reykjavik Airport (BIRK) in Iceland and refueling a final time at Prestwick Airport (EPIK) on the Western coast of Scotland before making the final leg to Duxford Airfield (EGSU) north of London. 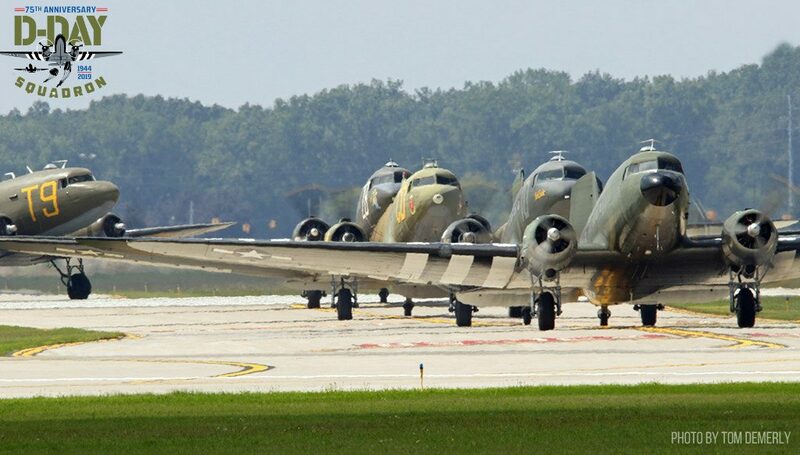 Once arriving in Duxford Airfield, the D-Day Squadron will join with its European counterpart, Daks over Normandy, to participate in multiple events on June 2nd-5th, 2019. The combined fleet of historic aircraft will cross the English Channel on June 5th, fly over Normandy, France, and participate in multiple events at Caen-Carpiquet Airport from June 5th-9th, 2019. 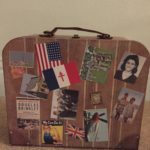 Be sure to keep up with the latest news and events as the D-Day Squadron will be making the final push to Normandy this spring. SUN ‘n FUN is the second largest aviation event of its kind in the world and is Florida’s largest annual convention. The six-day event offers, jet teams, aerospace related exhibits, educational forums, aircraft static displays, professional gatherings of aviation and economic development groups, daily and evening airshows. For the other 51 weeks of each year, activities on the SUN ‘n FUN Expo Campus include public and private events in the facilities on nearly 200 acres. The Aerospace Center for Excellence (ACE Educational Facilities) has introduced Aerospace Discovery at the Florida Air Museum in a dynamic fashion as it incorporates aviation history into hands-on interactive learning stations for students of all ages.